Hi there, i don't know where else to ask sorry if you're just the wrong guys. I have certain IBM PC games i would like to contribute to disk preservation and tosec in general and have several questions about how to correctly dump an image from a floppy disk, especially pc booter disks since i can't for my life figure out which tools are the right ones to create an .img like the ones in your pc booter game set. I can't even just open your .img images with the tools I used so far to view their content like with the .ima ones. Could you please give me a hint where to find answers for my questions? Thanks! The IBM PC Disk dats were started by Grendel long ago i think, he was using his original media (for obvious reasons) to create the IMG files but i don't remember which software and don't have the logs anymore. Maybe you can try some different tools to see if you can open the images or even recreate some of the dumps if you have some original disks of existent sets i guess. Maybe some tools like WinImage, don't know which are the best alternatives. A guide on how those dumps were done and how to contribute with more would be of great value to our site, maybe you can help us with that while we wait for Aral to shred some light on the subject. Rawwrite is a great program but i just cant remember if it handles the protection of PCBooters successfully. A lot of the old Booters could only be ripped with CopyIIPC and a PC Option Board. Finding an option board is now near impossible. I no longer have any PCBooters as i gave away the bulk of my PC floppies a few weeks after windows 95 was released and have regretted it since. The only ones i kept ran in a dos window under win95 and none of them were Booters. 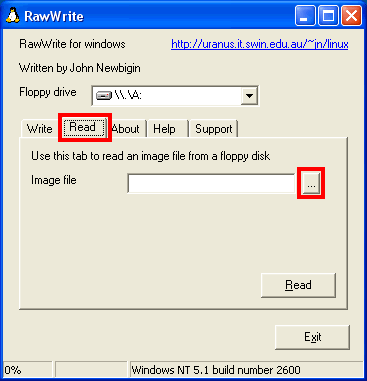 I was unable to image a disk with copy protection using RawWrite (eg. King's Quest III - To Heir is Human (1987)(Siera On-Line, Inc.)(Disk 1 of 2)(KQ3 DISK 1)[vid hcemv][cp bad track disk 1]).